“There is no budget,” was the reply from 67 Pall Mall when the London private club’s management asked me to choose wines for a recent master class. Over the years I have led many tastings, but this seminar was especially memorable. Most events are organized around themes of a vintage or producer, but for this masterclass we opted for a totally new concept suggested by Vinous co-founder James Forsyth: ten wines that had a personal significance in shaping my life in wine. 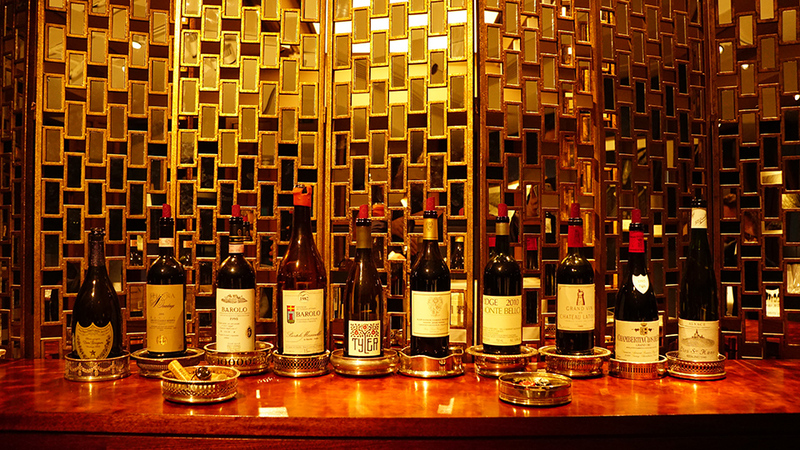 Located in London’s tony St. James’s district, 67 Pall Mall is an oasis for wine lovers who flock to this relatively new but already well-established private club for its extraordinary selection of wines (dozens of which are available by the glass) and events. Our own Cappellano vertical, held the night before, was an enormous success. It was a real privilege to share these extraordinary bottles with the club’s members over several leisurely and very pleasant early evening hours. When I was a child, my father told me “There are two great wines in the world – Barolo and Champagne.” Little could I have imagined just how powerful those words would turn out to be. In reality, though, I was fortunate to grow up with wine from a very young age. My Sicilian grandfather drank a glass of bulk white wine with half a peach in it at every meal. From him I learned that, at its essence, wine is a part of everyday life and an essential part of the table, as opposed to a collectible. Even now I remember that, for his generation, wine was first and foremost a food - consumed mostly for its caloric content - than the beverage of pleasure it is today. My American grandfather had the benefit of an education and enjoyed a successful corporate career that enabled him to taste more ‘important’ wines. 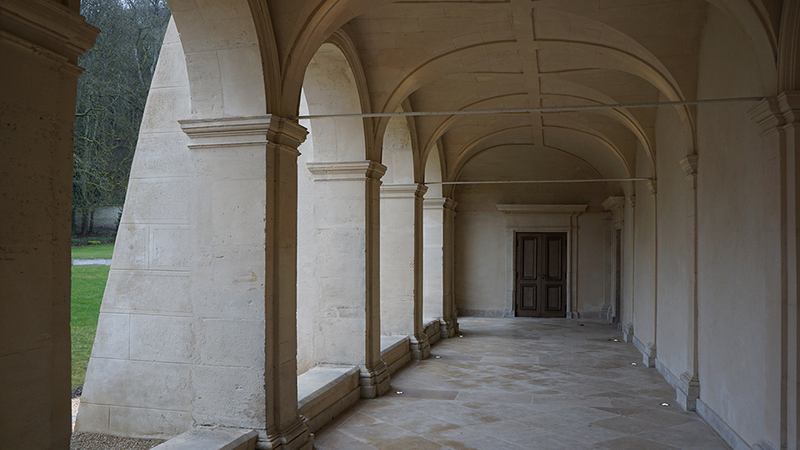 He spoke reverentially of La Tâche as an unobtainable beauty reserved only for the privileged few who could afford it. With him I tasted my first Côte-Rôties and Burgundies (Trapet Chambertin). Needless to say, this was well before these wines were considered rare or particularly prestigious in any way. Later, when I was a teenager, my parents opened a specialty food and wine shop in Sarasota, FL. Today, extra-virgin olive oil, balsamic vinegar and imported cheeses (among many products) are easily found throughout the United States. That was hardly the case thirty years ago. The wine section consisted of mostly Italian wines, although my parents also sold a considerable amount of Bordeaux futures. I naturally gravitated to the wine aisle. I was drawn to the labels and wanted to understand what each and every word meant. The wines of Bordeaux and Burgundy were the subjects of my research projects in high school French class. Sensing a growing interest, my parents gave me many books to read. When we went out to dinner, I was handed the wine list and tasked with ordering a bottle for my parents to enjoy (OK, I might have had a taste, but it was for research only… promise). I can’t think of a better education. 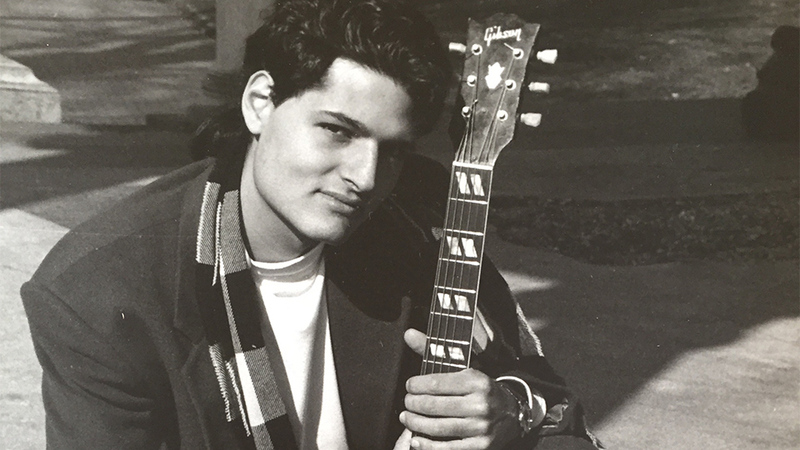 My parents wanted me to run the family business, but I was a rebellious teenager more interested in girls and guitars, so ultimately I moved to Boston and attended the Berklee College of Music. Of course, it is quite ironic that my career path ultimately led me right back to wine! It is with that background that I chose these ten wines to show at my 67 Pall Mall masterclass. Of course, limiting the selection to just ten bottles was not easy, but each of these wines has a deep meaning to my personal journey. In some cases, the vintages are quite specific, but in other cases we used vintages that were available commercially in London. Dom Pérignon is the first great wine I have a memory of. When I was a young boy, my father, Giuseppe, would give a case of DP, in original wood case, to his best customers. “It was cheap back then,” he told me recently. “We also bought quite a bit of Cristal,” he added. 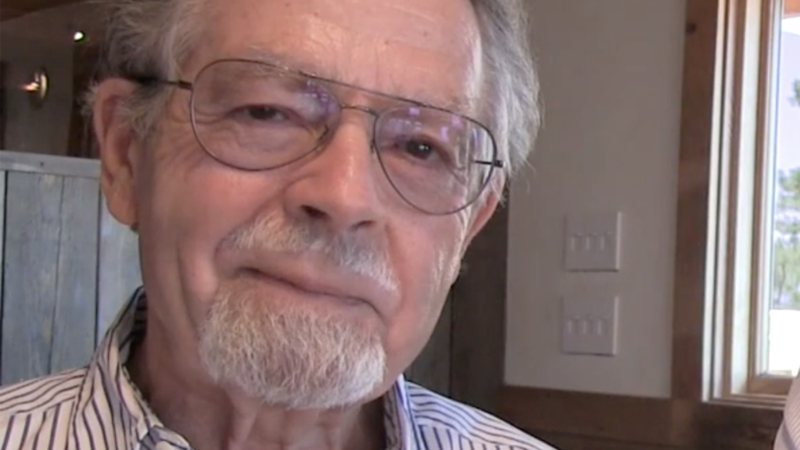 In the mid to late 1970s, the wines he was gifting would have been the iconic vintages of the late 1960s and early 1970s, something that is almost impossible to fathom in this day and age. Dad is part of the post World War II generation that left Europe for the promise of a better life in the New World. Armed with a fourth grade education and not much else, my father worked a series of low-level jobs. Over the years, he saved enough money to buy part of the fish market where he worked. Eventually he bought the whole thing and grew it into an import/export business. A successful entrepreneur two times over, my father remains my single biggest inspiration and role model. Later on, as I grew up, Dom Pérignon was always the Champagne my parents opened for special occasions, meaning once every year or two. It was a splurge back then, and it is today, too. On this night, we opt for a relatively recent release with some bottle age. I still remember the first time I tasted the 2002 Dom Pérignon. It was so exuberant, with the ripeness of the Chardonnay very much in evidence. This bottle surprises me with its remarkable freshness, energy and tension. It is simply magnificent. Because 67 Pall Mall added a Champagne for the reception, we drank the 2002 Dom Pérignon at the end of our evening, rather than at the start, as originally contemplated. No matter, the 2002 was a fitting conclusion to a great night of wine and conversation. One of the many lessons I learned from my parents was an appreciation for the role of wine at the dinner table. Almost every night they brought something home for us to taste. Antinori, Fèlsina, Isole e Olena, Castello di Monsanto, Bruno Giacosa and Gaja were some of the producers whose wines I first tasted at our kitchen counter, usually paired with my dad’s superb cooking. I wanted to show a collectable, ageworthy wine that does not cost a fortune and that consumers can still buy by the case. Over the years I have had the opportunity to taste every vintage of Fèlsina’s flagship Chianti Classico Riserva Rancia. Those tastings, along with numerous other retrospectives of top Chianti Classicos, all available on Vinous, led me to understand that Chianti Classico is the top terroir in Tuscany (as opposed to Montalcino or Maremma) for exceptional, ageworthy wines of finesse. As I taste through all the bottles before guests arrive, I am simply blown away by the 2006 Rancia. Yes, I expect it to be good, even great, especially in 2006, a superb Tuscan vintage. But I am not truly prepared to see the 2006 Rancia keep up with the 2010 Ridge and Kapcsándy or the 1982 Latour and 1993 Rousseau Bèze. And yet it does. Quite simply, the 2006 Rancia is a supremely beautiful and moving wine of the very highest level. I can’t possibly pay Giuseppe Mazzocolin a greater compliment. The only problem with the 2006 is that it needs another five years in bottle, at least, to be at its very best. 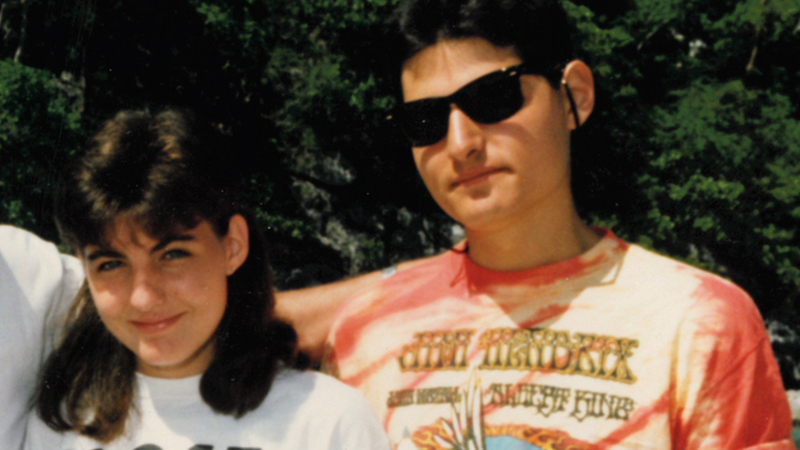 With my sister, Tania, in the great decade of the 1980s…. I first traveled to Piedmont in 1997, with my parents and sister. Family trips were a tradition. After visiting relatives, the four of us would take a week off by ourselves. My sister and I took turns choosing the destinations. She picked the art cities and places of culture. One year we rented an apartment in Piazza Santa Croce, in the heart of Florence, and then visited all of the city’s top sites with our own private tour guide. But I liked to eat and drink. 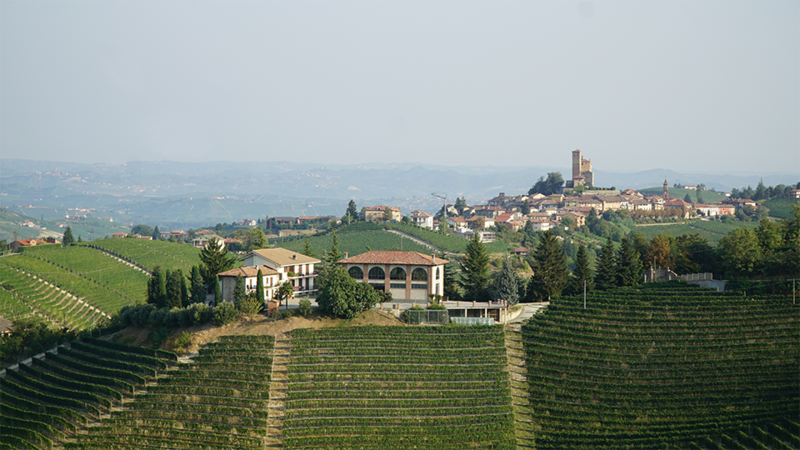 I had read a ton about Piedmont and tasted the wines for years. It was a fabulous week. Each day we visited a different town. As usual, I was given the wine list at every restaurant. I was hooked. I spent the next two years preparing for my next trip. It happened in 2000, right after Italy lost the Euro football championship to France at the very last second. Bartolo Mascarello is the first producer I met and visited with in Piedmont. The funny thing is that I had originally intended to visit Mauro Mascarello, but I called the wrong number, and ended up at the iconic small cantina on Via Roma in the heart of Barolo instead. 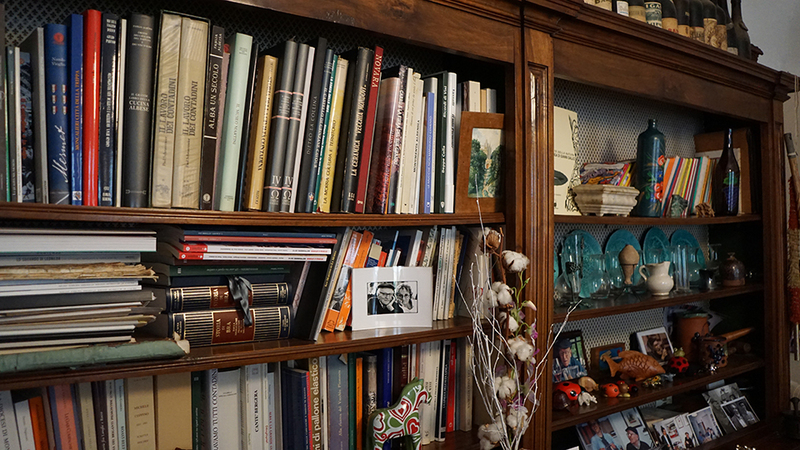 We spent several hours in Bartolo Mascarello’s small office talking about everything from wine to politics. Mostly politics. Although Mascarello was confined to a wheelchair, his imagination and energy had no bounds. The hours passed by lazily. Back then, all of the attention, both from media and tourists, was centered on the modernist producers. I never saw other visitors at the cantina, and you could buy as much wine as you wanted. To say things have changed since then is a massive understatement. Maria Teresa Mascarello took over after her father’s passing and has since propelled the domaine to unprecedented heights. A lucky visitor today may have an opportunity to buy a single bottle, if an appointment is granted at all. A few months after that visit, we found a bottle of the 1982 Barolo in one of Mantova’s best restaurants. I can still remember tasting that wine, and how incredibly pure it was. Now, all these years later, the 1982 is much further along in its life. Even so, the wine’s complexity and persistence are the things dreams are made of. I was very lucky to be introduced to the wines of Bruno Giacosa when the Maestro was at his peak and the wines were largely unknown to all but the most diehard Italian wine lovers. My dad always had a gleam in his eye when he brought a bottle of Giacosa Barolo or Barbaresco home for dinner. I remember paying $55 a bottle for the 1989 Santo Stefano Riserva upon release. It was the most I had ever spent on a bottle of wine for myself. I was not disappointed, let's leave it at that. When I started writing about wine professionally, I began having access to a lot of great wines from all over the world. As a wine writer and critic, it is easy to accept the many invitations to tastings and dinners that inevitably arrive, and to live off the largesse of others. But I never wanted to be a freeloader, so, although I could not afford the wines my friends liked to drink, I always brought the best I had. Often, they were Bruno Giacosa Red Labels from the 1960s, 1970s and 1980s. And you know what? Those wines never let me down, even in the company of established benchmarks. I remember one dinner that paired the 1989 Haut-Brion with Giacosa’s 1989 Barbaresco Santo Stefano Riserva. Just two of us, and we drank both bottles, plus a bunch of other things, with great joy. What a night that was. The 1998 Bruno Giacosa Barolo Le Rocche del Falletto was a current release in 2003/2004 when I started putting together Piedmont Report, which remains the only newsletter ever written focused only on the wines of Piedmont. I am still paying off my student loans from MIT because I could not resist the 1998 Rocche at Marty’s in Allston when it was on sale. Either that, or Ian McFadden, now at Crush Wine & Spirits, is a great salesperson. Now, fifteen years later, the 1998 is in its early plateau of maturity. With beguiling aromatics and its mid-weight structure, the 1998 is sublime on this night. A year or so later, in 2005, Bob Parker asked me to join him at The Wine Advocate. At first I politely declined, as I wanted to be on my own, but a year later, with a young family a central part of my life, I accepted. I could have shown any number of bottles to represent Santa Barbara in this tasting. A wine from Au Bon Climat or Ojai would have been perhaps more obvious given the role Jim Clendenen and Adam Tolmach played in championing Santa Barbara in the early days and their influence on so many of today’s younger generation. Ultimately, I chose the 2015 Tyler Chardonnay because proprietor Justin Willett is one of the producers who embodies all the qualities that make Santa Barbara so exciting today. The Tyler 2015s are absolutely brilliant across the board. For this tasting, 67 Pall Mall sourced the appellation-level Chardonnay, as opposed to one of the vineyard designates. It didn’t matter much. The wine is absolutely brilliant, its quality appreciated by everyone at the table. I also enjoy serving a white in the middle of a tasting to show that fine whites are serious wines and not simply the prelude to ‘important’ reds. I have had the good fortune to taste Kapcsándy’s 2010 Cabernet Sauvignon Grand Vin on many occasions, from both bottle and magnum. Here, in London, 5,300 miles away from Yountville, the wine is simply extraordinary. Then again, Kapcsándy’s State Lane Vineyard is widely considered one of the top sites in Napa Valley. Of all the bottles on the table, the Kapcsándy garners the most rapturous attention because of its stunning beauty and the surprise it delivers to an audience weaned mostly on European wines. Quite simply, the 2010 Grand Vin remains a towering achievement from Lou Kapcsándy, his son Louis, and their late winemaker, the super-talented Denis Malbec. All I can say is… wow! 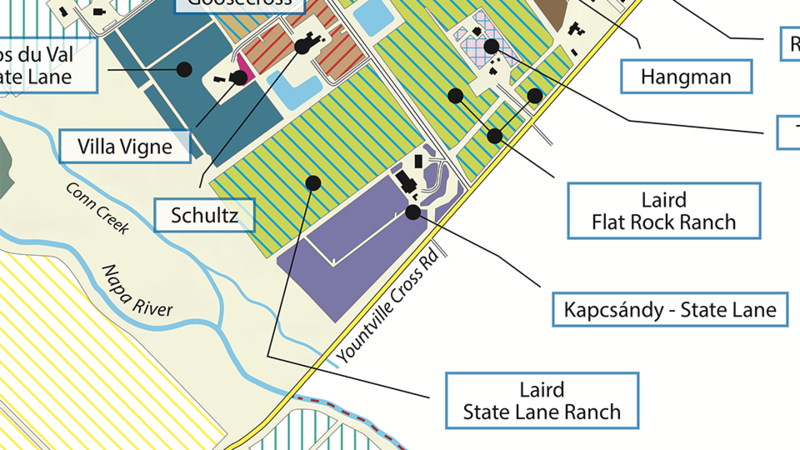 Kapcsándy’s State Lane Vineyard as seen in the Vinous Map of The Vineyards of Napa Valley: Yountville, by Antonio Galloni and Alessandro Masnaghetti, 2016. If the United States had a formal classification of estates similar to that of Bordeaux, Ridge would be a First Growth. 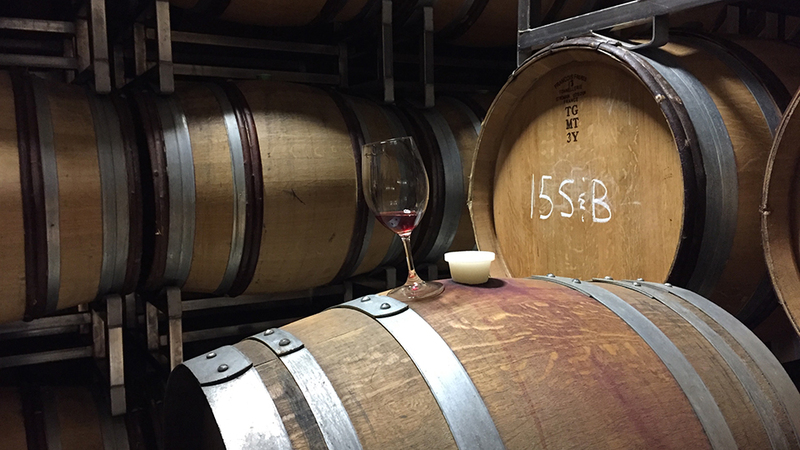 Ridge has made world-class wines since the 1960s, although the original vineyard’s history goes quite a bit farther than that. Over the years I have had the opportunity to taste many vintages of Monte Bello, including most, if not all, the reference points. Those wines taught me not only about the greatness of Ridge and Monte Bello as expressed by Paul Draper and now his protégé Eric Baugher, but also about the potential of the Santa Cruz Mountains, which is, in my view, one of the most pedigreed regions in the United States. I remember serving the 1974 Monte Bello, from my cellar, blind, to a group of Francophile collectors a few years ago. They were totally blown away, and none of them came close to guessing California or the wine’s age. I chose the 2010 Monte Bello to pair with the Kapcsándy Grand Vin. The healthy presence of Merlot with touches of Petit Verdot and Cabernet Franc complements the Cabernet Sauvignon beautifully, while the signature notes of American oak add depth to a rich, beautifully layered wine endowed with magnificent purity and pedigree. Tasted next to the Kapcsándy, Monte Bello is a bit more overt and dense, but equally compelling. I am not sure there are two other wines that can make as eloquent a case for the virtues of California. Quite simply, the 2010 Monte Bello is a total stunner. Even better, it remains one of the most affordable, collectible, age-worthy wines readers will find anywhere in the world. One of the first wine books my parents gave me was Parker’s Wine Buyer’s Guide, which I read cover to cover until it started to fall apart. Never in a million years could I imagine I would write the chapters on Italian wines in the last edition of that book published! In May 2012, Bob and I spent some time in Napa Valley tasting the 2002s at age ten. It was our second year doing those tastings side by side. I learned a great deal from Bob during the years we worked together. The life of a critic is often very solitary. Many nights away from home and room service after long days of tasting are the norm. I make it a point to avoid the large dinners, parties and soirées that are in full swing throughout the year. But the most important thing I learned from Bob is that wine criticism must serve the consumer first and foremost, no matter what the consequences of publishing a negative review might be. “I want you to think about which regions you can give up because I want you to cover Bordeaux when I retire,” Bob told me on our second day of tasting. From that moment on I knew Bordeaux would play a central role in my life. 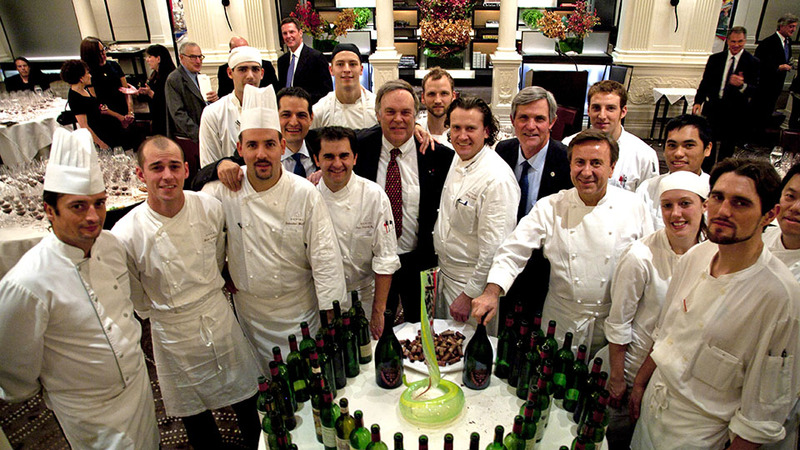 Later that year Bob and I hosted an epic charity lunch at Restaurant Daniel to benefit the Navy SEALs Foundation featuring the 1982 Bordeaux at age thirty. I wanted to honor Bob’s role in my life with one of the truly epic wines from 1982, the vintage with which Bob made his reputation. Tasting the 1982 Latour brings back memories of that truly moving afternoon at Restaurant Daniel. A spectacular, rich Pauillac, the Latour captures all the best the year had, and still has, to offer. Still quite fresh and dense, with seemingly endless layers of fruit, the 1982 is as good as it gets. This is a stellar bottle of one of the world’s truly great wines. Well, the 1993 Chambertin-Clos de Bèze is indeed sublime. The most beguiling and alluring wine of the evening, the Bèze seems to answer questions with more questions as it draws us in with its stunning beauty. This is what great, profound Burgundy is all about. 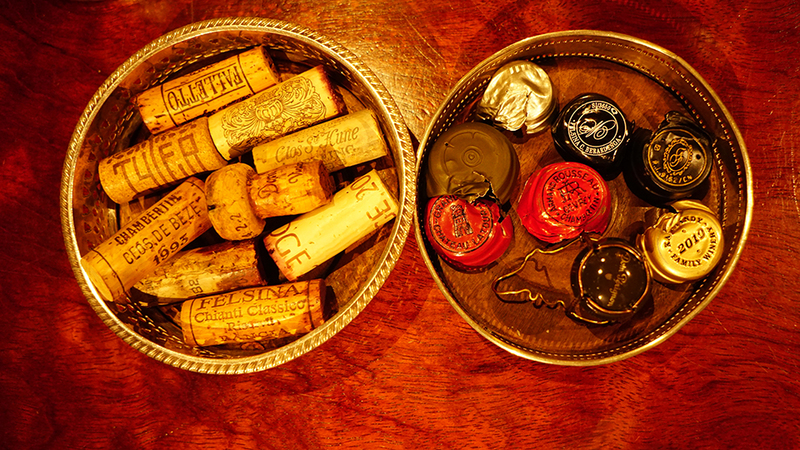 What else is left to say on a night in which so many truly epic wines are opened side by side? Not much. I will add that conventional wisdom dictates that the presumably more elegant Burgundy be tasted before the bigger Bordeaux, because, as that line of thinking goes, bigger wines are supposed to overwhelm more elegant wines. I think that is all a bunch of nonsense, and so I intentionally served the Rousseau after the Latour. Thankfully, that decision is more than vindicated by how the wines show. The 1990 Clos Ste. Hune is deep in color and overall intensity, with tons of textural richness and pure concentration. An exotic mélange of honey, chamomile, mango, hazelnut, wild flowers and candied orange peel opens up effortlessly in the glass. Even with all of its opulence and richness, the 1990 retains terrific freshness as well as energy. On this night it is simply magical, and a great way to wrap up a truly unforgettable evening. 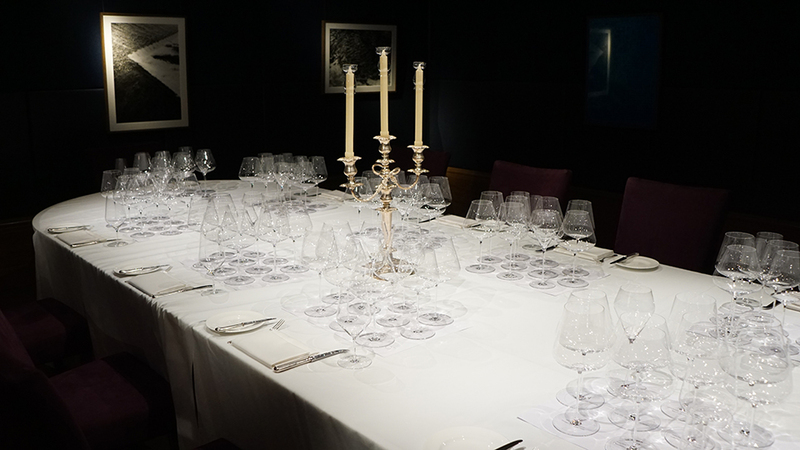 I would like to thank the entire staff at 67 Pall Mall, Founder & CEO Grant Ashton, and Sommelier Terry Kandylis for helping to curate a fabulous night of wine and discussion. Of course, there are many more wines that have made a deep impression on me over the years. These are some of them. 1976 Beaulieu Vineyard Cabernet Sauvignon Georges de Latour Private Reserve – I have been fortunate to have many important mentors throughout my life. I owe the early part of my career in finance to several senior-level executives at Putnam Investments who took a chance on me when I basically had very little experience. No one played a greater role in my early development than Vinnie Esposito, who was behind me getting a plum expat assignment at age 30 in a firm that only had about a dozen expats, all of them at the Managing Director level or higher. Vinnie also gave me a number of gorgeous wines from his cellar to drink, including fabulous vintages of Pichon Comtesse and many others. But it was the 1976 Georges de Latour Private Reserve that totally blew me away. It was the first truly epic Napa Valley Cabernet I ever tasted, and it left a deep impression that remains with me to this day. 2009 Borgo del Tiglio Ronco della Chiesa – I will never forget it. I flew to Italy after two weeks of tasting whites in Chablis and the Côte de Beaune for The Wine Advocate. Name the property and the wine…I tasted it. All the greats. The first night in Italy, we ordered Borgo del Tiglio’s old-vine Friulano Ronco della Chiesa. It is a wine I know well. And yet, nothing could have prepared me for what I tasted. After all the great wines of Raveneau, Dauvissat, Leflaive, Roulot, Comtes Lafon and so many others, the Ronco della Chiesa was utterly magnificent. 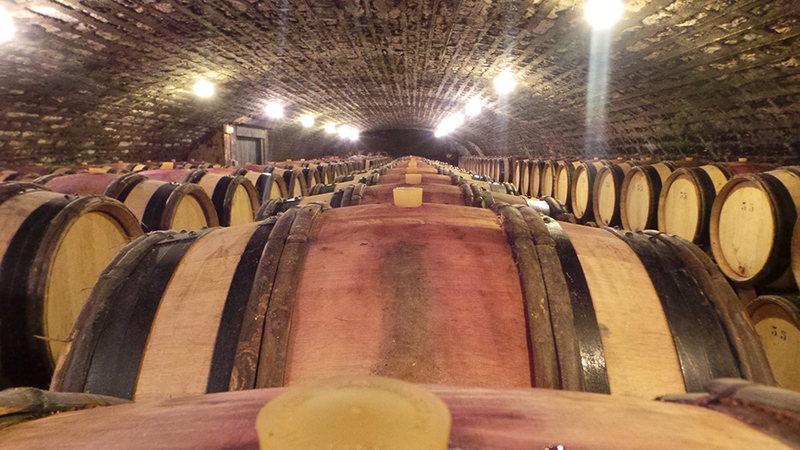 It was as just good, and in some cases better, than many of the wines I had just tasted in Burgundy. That was the moment I understood the true quality potential of Friulian whites. 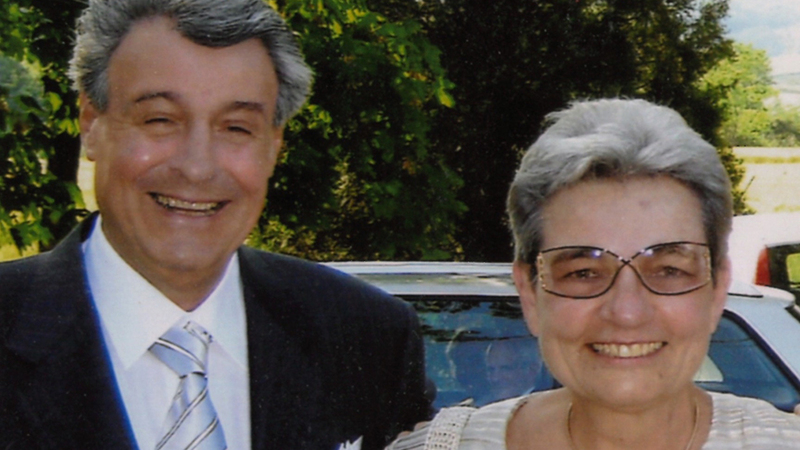 Jacques Selosse Contraste – Marzia introduced me to the Champagnes of Anselme Selosse on one of our first dates. While the Selosse Champagnes are virtually impossible to source anywhere, they are easiest to find in Italy. 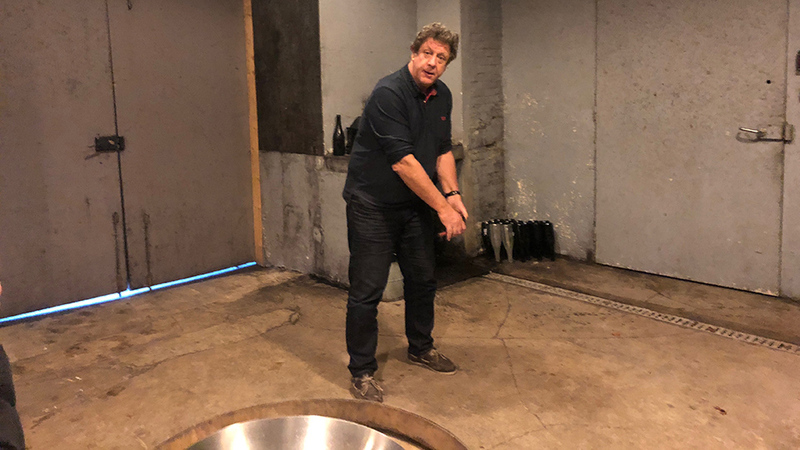 Pepi Mongiardino was one of the first importers to believe in the young Anselme Selosse and his views, which were considered quite radical in the early days. Because of his longstanding support, Mongiardino still receives a huge allocation of the wines. Contraste (today called La Cóte Faron), 100% Pinot Noir from Aÿ, remains one of my favorite Selosse Champagnes and is also the archetype for the lieu-dit series that followed some years later. I would have loved to include a Selosse Champagne in the 67 Pall Mall tasting, but two Champagnes out of ten wines, with so much ground to cover, seemed a little excessive, even for me!